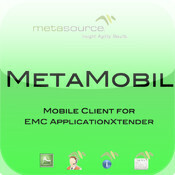 MetaSource recently released a new product called MetaMobil, a mobile technology device that links directly to EMC ApplicationXtender. Basically, you can now access important information from the ApplicationXtender software directly to your phone, instantly at any time. The product is easy to use and integrates directly with you software to allow you access to your sensitive information right at your fingertips. With MetaSource's MetaMobil product, you can now work on-the-go when you need to and not have to worry about information being lost or stolen because of their security measures. The newest way to manage your documents is here with MetaMobil. ProConversions can show you how to best use MetaMobil with your current business processes. Let us be your source for moving your business forward with the latest technology so you can improve efficiency and grow your business. With our expertise and knowledge with the latest document management technologies, we can get your business up to speed and implement this new technology solution for you. MetaMobil supports a range of functions most people use every day. You can easily find documents and display them right on the device. An optional component (MetaSource Mobile Server) will allow you to upload or delete content if you have rights. MetaMobil decides which functions are available to you based on your ApplicationXtender security profile.